1/16 German Small Metal Wire Thimble Discounts Apply ! 1/16 German Small Metal Wire Thimble. 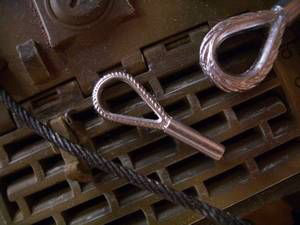 Add that extra detail to your 1/16 model or RC tank with these very detailed metal parts. Each piece can be painted and weathered. Drilling required for wire. Please Note: Use ABE10 1/35 1.0mm steel towing cable sold separately. 1 each.